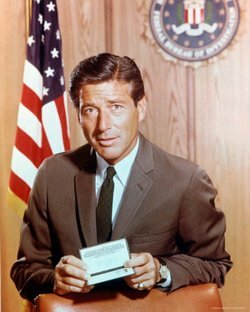 Efrem Zimbalist, Jr.: (Laughs) Why, thank you! I’m so honored! Well, I only just received the set today, but I’ve already started watching it, and it’s fascinating to realize that this was the first time the FBI had ever really been portrayed on television before, especially considering how often we see FBI agents on TV today. That’s true. And, of course, we had no sense of the historical importance of it at the time, because it was just the time we were living in. But we were enormously conscious of the weight of authority and judgment that the Bureau represented. Of course, in those days, Edgar Hoover was the director. He was the founder and the director, a legendary figure. So to be working in his office was something that we were very conscious of, and we were hopeful that we could come out doing the right thing. Was he apprehensive at all about having the FBI portrayed on television, or was he excited by the possibilities? He had turned down, I’m told, literally hundreds of requests, because he was not a lover of Hollywood. He was very suspicious of it, and it was only because Warners had done “The FBI Story” with Jimmy Stewart, it was only because of that movie that he had confidence in Warners and gave them the permission to do the series. But once he had done that, he made all of the files of the FBI available to us – well, to the writers – and all we had to do was choose the stories that we wanted. But they had to be authentic stories. You couldn’t make them up. But, you know, writers are writers, and they didn’t like living under those kinds of restrictions, so sometimes they would just say, “To hell with that, we’re going to write our own story,” and they’d have a jewel robbery, for example. And he would turn it down, because the FBI had no jurisdiction over jewel robberies. So in that sense, he kept a pretty tight rein on everything, but only for authenticity’s sake. Did you feel a similar pressure on your side of the camera to act as much like an authentic FBI agent as possible? No, I never felt that. I loved doing it from the very first show that we did. I loved Quinn Martin, who produced it, who I think was one of the most outstanding producers in town at the time. Maybe of all time. He was a dear friend of mine. And we had two very excellent directors, and, of course, the best cast in the world, the best guest stars, and the production…Quinn Martin put every cent of the budget on the screen. He would not skimp. He didn’t hold back on anything except where it didn’t show. But if it showed, then he paid it, so we had the best of everything. It was a delight to be in a series like that, where we knew that everyone was after the same objective and the same goal. I’ve always been curious if there was any sort of rivalry, even if only in a friendly fashion, between Quinn Martin and Jack Webb, since they both covered similar law-enforcement territory. Jack Webb? I don’t know anything about that, if there was. I don’t even know if they knew each other. I had no occasion to talk to Quinn about Jack Webb. 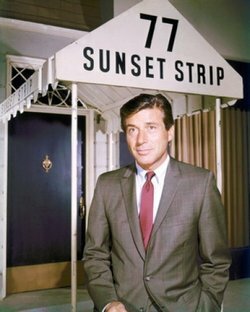 He was made the producer of “77 Sunset Strip” during the last year of that show, but if he and Quinn had a rivalry…I don’t know, I couldn’t speak to that. You mentioned how “The FBI” had the best guest stars. Did you have any particular favorites? You know, I remember some years ago that someone, maybe Warner Brothers, sent me a list of all of the guest stars that we had on “The FBI” during all the years we were on the air, and I was just bowled over. I mean, it was just absolutely extraordinary. The top people in stage, screen, and television, national and international, from absolutely everywhere. It was unbelievable. And that was another instance of Quinn’s pocketbook. He would send to Europe and get the great stars from England, France, and so forth, and all of the best American actors and actresses on Broadway and in Hollywood. He would just lavish care and excellence on the screen in his desire to present the best show that he absolutely could, and he did. 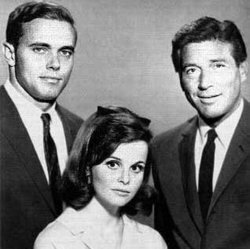 Do you happen to recall any guest stars who were up-and-comers at the time but went on to bigger and better things? Yes! We gave him his first role. Quinn caught him in New York, where he’d done a play. I don’t know if it was actually on Broadway, but Quinn saw him and brought him out. And there were many cases like that, although it’s hard for me to recall any other specific names at the moment. That’s quite alright. Beyond “The FBI,” I also wanted to ask you a bit about your work as a voice actor. I was a huge fan of “Batman: The Animated Series,” where you provided the voice of Alfred. Oh, I enjoyed it. I adored it. I loved it! Well, the director…again, you’ll have to excuse my stupid memory, which is awful, but she’s a darling girl and a dear friend and a brilliant director of several animated series in addition to “Batman.” It was a joy working with her. We all loved and adored her. I worked with her for, what, three or four years? It was one of the most wonderful times of my life…and I won’t forget that! I did! I don’t think that was Warner Brothers, though. That was one of the first ones that I did, but I also went on to do many more. “Spider-Man” and several other shows. It was always a lot of fun. What was it like to get the opportunity to act alongside your daughter Stephanie on “Remington Steele”? Well, working with her on her show was really the favorite thing of mine in all of my fifty years in Hollywood. Just to turn up on the set was a joy. We’re very, very close, and I have the highest regard for her talent, but to work with her was just outstanding, and I loved every minute of it. I was privileged to be on five episodes, I believe, including the last two shows. We shot in England, Ireland, and Hollywood. And it was one of the best times of my life. Just the joy of sharing the work with a person who is one of the dearest to you…it was extraordinary. I loved it. They did these extraordinary things that you’d just marvel at. They were delicious. But they were cheap, too! I mean, (executive producer) Bill Orr didn’t pay any more than he had to. But that’s understandable. Most people who were under contract were pumping gas one day and starring in a TV show the next, and they had no background in acting to begin with, so they were paid very little. Maybe $100 a week, some of them. So he wasn’t paying them any more than he had to. I don’t mean for one instant that he or Warner Brothers weren’t kind. They were very kind. But they weren’t just patsies. If an actor was going to complain about salary, billing, dressing room, or whatever, he’d have them come up to his office while his tailor was there. And the tailor would be fitting him for a suit, the tailor would be going around him on his knees, placing pins and whatnot, and Bill would be looking in the mirror, and he’d answer their questions while intentionally focusing more on the suit than the actor. And eventually they’d get so frustrated and disgusted that they’d leave without getting what they’d come in to get. (Laughs) He had a fine art of doing it without ever saying, “No,” or, “You’re getting what you’re getting and not a cent more.” He was an actor himself, and a very good one, and he played the role of producer deliciously. No, I’m ashamed to say that I really don’t. Well, I just wanted to say that there’s an audio performance of your father (Efrem Zimbalist) and mother (Alma Gluck) performing “Swanee River” in 1915. When I found out I was going to be speaking with you, I read about it and enjoyed the chance to hear it. Oh, yes, well, they gave many joint performances and concerts together. He would accompany her either on the violin or the piano, but, yes, they appeared together a great deal all over the world. I’m glad you got a chance to hear them! As I am. Well, it’s been a pleasure to speak with you, sir, and I just want to reiterate that I’m extremely happy that “The FBI” has finally made it to DVD. Dw. Dunphy On… What Do We Do With Non-Canonical Media?